French police have released a video of storming of the factory in the outskirts of Paris where two men suspected of Wednesday’s attack on the French magazine Charlie Hebdo were hiding. The video shows the National Gendarmerie Intervention Group (GIGN), a special operations unit of the French Armed Forces, launching the assault on the printworks in Dammartin-en-Goele area, northeast of Paris. Numerous gunshots are heard, with flashes and explosions visible in the distance. The Charlie Hebdo terror suspects Cherif and Said Kouachi reportedly opened machine gun fire at security forces . The two were killed in the assault and one policeman was injured. 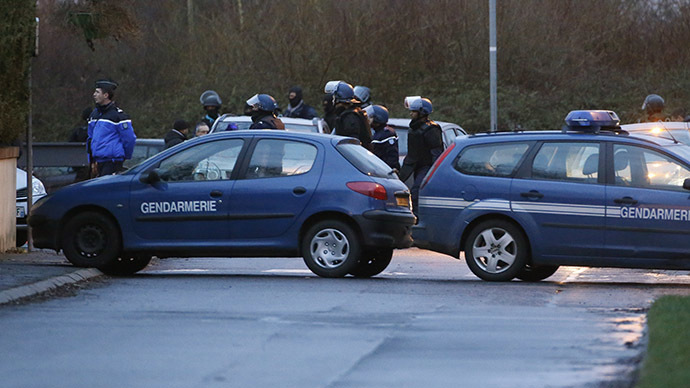 A worker who was taken hostage in Dammartin-en-Goele was freed.